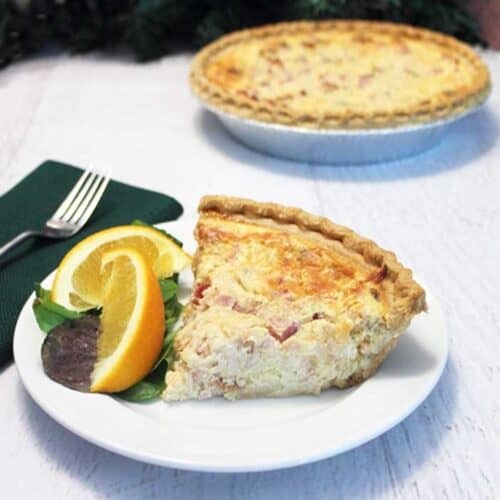 Whether it's a special brunch, like Mother's Day, or an every day dinner, this delicious Bacon Ham and Cheese Quiche is the perfect meal. It brings all your favorite breakfast ingredients together in one creamy pie. Crisp bacon, chunks of ham and creamy Swiss, set in a flaky crust, make for one flavorful treat. Fry bacon in medium skillet until crisp. Remove from pan onto paper towel and let drain. Melt butter in the same skillet, along with some of the bacon fat, if desired. Add onion and cook until translucent, approximately 5 minutes. Set aside. Grate cheese and chop ham. Combine eggs, cream, Swiss cheese, ham, onion and crumbled bacon together. Pour mixture into pie crusts. If using store bought pie crust, place the pie plates on a cookie sheet. Bake for 10 minutes at 450 degrees then turn down heat to 325 degrees and cook until firm, about 50-60 minutes. Check often to make sure that crust is not getting too brown. If it is, use foil to cover crust and continue cooking until egg mixture is set. Cool 10-15 minutes to make it easier to cut. Serve in wedges with fruit and crusty bread.